This entry was posted in acceptance, awareness, change, choice, obstacles, wisdom on 12 July 2016 by Martina. Last week, in light of the recent tragedies and violence in the US and abroad, I wrote a bonus blog and recorded a video on how we make sense of the senseless. The bottom line, for me, was that we stop trying. It’s virtually impossible to make sense of something that goes against our very nature. Trying to attribute rational thinking to such a problem becomes an endless cycle of frustration, grief, and disconnection. Then, this past weekend, I stumbled across this video by Mingyur Rinpoche. I admit that I clicked on it because of the title, “I’m too lazy to meditate,” because I am too lazy to meditate. Well, I’m not sure if “lazy” is the right word – but you get what I mean. In the first few moments of the video, he gives the basic answer that I gave to dealing with the senseless violence: Stop trying. Or in the meditation example, stop fighting the laziness. 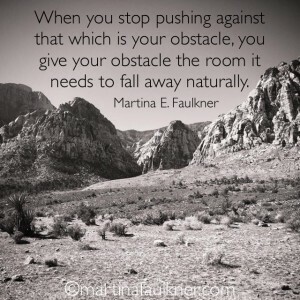 When you stop pushing against that which is your obstacle, you give your obstacle the room it needs to fall away naturally. I believe that the body and soul have a natural inclination to homeostasis. I also believe that all the obstacles we face in our lives are our soul’s journey through remembering who we are at our core, and each challenge brings us that much closer to the central truth. Therefore, if our natural inclination is to return to center, and the obstacles are there to assist us in doing just that, it makes sense that our job is to stop resisting the obstacle in order to allow it to teach us what we need so that it can fall away. Did you catch that? Sometimes, it’s truly as simple as taking a step back and accepting that which we perceive to be in our way. It’s often this basic act of acknowledgment that allows the obstacle to go. In the case of being too lazy (tired, overwhelmed, frustrated, scared, etc.) to meditate, as Mingyur says, it’s about taking a step back, accepting the state you’re in, and reframing your perspective to welcome the obstacle into your life, which paradoxically, allows it to go. I really enjoyed this video, and I hope you will too. I write often about how to create change in our lives, and how awareness and small consistent steps have the most lasting effect. This video describes just that, and for me, it’s perfectly timed. I have been frustrated with my lack of meditation and routine and itching to get back to it. However, my frustration has caused me to feel overwhelmed which has prompted me to not try. Yup – that’s what I said. Mingyur’s video is a reminder to me that it’s not about trying or perfection, it’s about choice and presence. Five seconds of meditation is still 5 seconds, and five seconds repeatedly will add up and eventually lead to five minutes. Whether it’s trying to make sense of the senseless, or feeling frustrated over the lack of a routine, it’s the resistance that keeps us stuck.